The figure provided reveals the distribution of money for something in education in Britain by each decade from 1981 to 2001. We can see clearly that there are three trends of spending in this period. Firstly, the money for insurance saw a regular increase with only 2% in 1981 to 8% in 2001. By contrast, the salary paid for other workers accounting for more than a quarter in 1981, followed by a decline by 13% in 2001. All the rest of elements have common situation were unstable. For instance,after accounting for 15% in 1981, Furniture and equipment were spent only 5% in 1991, went up to 23 % in 2001 while resources were received 15% of money in the first period; then increased to 20% in 1991 before saw a decrease with 9% in last period. 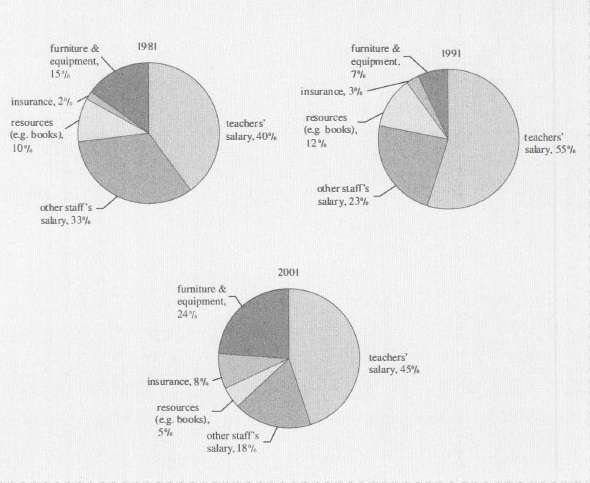 The status of payment of salaries for teachers also was similar with 40% in 1981, 50% in 1991 and 45% in 2001. In conclusion, we may say that money for education in England often spent pay for teacher and insurance was at least payable component. The figure provided reveals the distribution of money for something(equipments or services) in education in Britain by each decade from 1981 to 2001. All the rest of elements have(had) common situation were unstable. For instance,after accounting(accounted) for 15% in 1981, Furniture and equipment were spent(wasted) only 5% in 1991, went up to 23 % in 2001 while resources were received 15% of money in the first period; then increased to 20% in 1991 before saw a decrease with 9% in last period. The status of payment of salaries for teachers also was similar with 40% in 1981, 50% in 1991 and 45% in 2001. In conclusion, we may say that money for education in England often(is) spent (on) pay for teacher and insurance was at least payable component. We can see clearly that there are(were) three trends of spending in this period. (thì hiện tại bạn ạ vì đây chỉ là câu nhận xét thôi. 3.hình như spend in thì hợp lý hơn spend on, không thì thui. dù sao cũng rất cảm ơn bạn góp ý.Mong là trao đổi thường xuyên hơn để cùng tiến bộ nha.